With our hand designed, wooden jigsaw puzzle product lines, our mission is to make unique, inspiring, heirloom quality, artisanal wooden jigsaw puzzles at affordable, mainstream prices using eco-friendly materials. From raw materials to retail packaging and beyond, we strive to be pioneers in eco-friendly craftsmanship and artistic creativity while pricing our puzzles at competitive prices. The first step in our jigsaw puzzle production process is to search the world for images rich in color, composition, perspective, and vibrancy. Once we find or create an image, we produce a Giclee print of it with archival ink on archival paper using state-of-the-art, wide-format printers. We then dry-mount it onto beautiful, FSC-certified, Birch wood; cut it into hundreds of tricky pieces; and package it with a title sticker that gives an indication of the size and difficulty of the puzzle. In designing our puzzles, we honor the rich history of the wooden jigsaw puzzle in adhering to the traditional folk cut style of rows and columns. We try to make each puzzle a clever, cohesive collective of individually interesting, attractive pieces that have both spacial uniformity and intricate detail. We are particular about the figurals included in our puzzles, as their wonderful, endearing element is offset by the greater ease in the assembly of the puzzle. 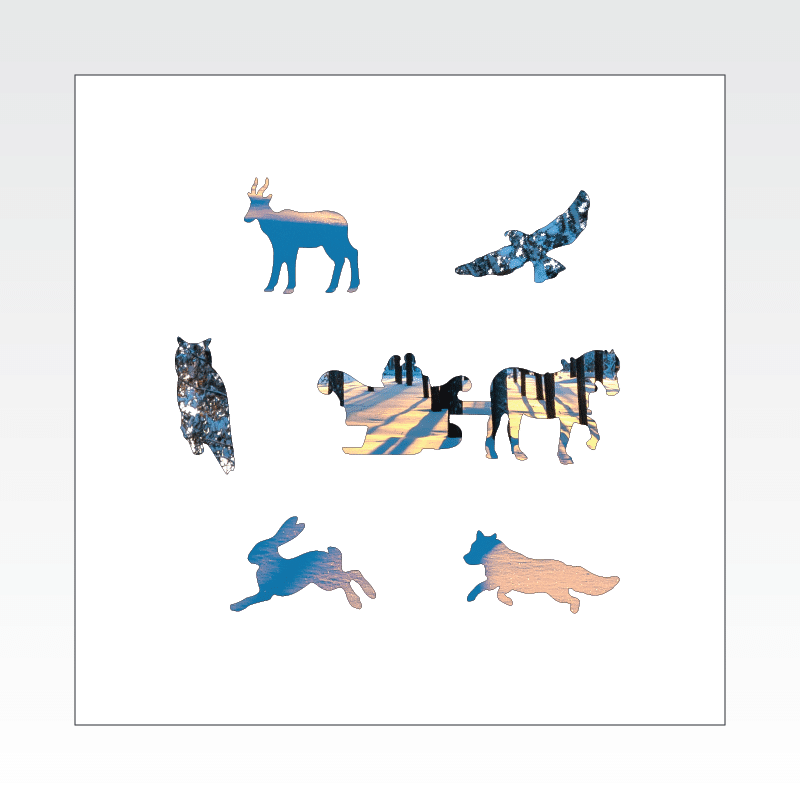 We place great importance on choosing and designing figural pieces in our puzzles to match the puzzle’s primary theme. 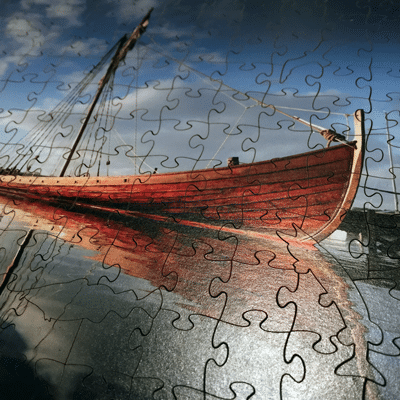 For instance, in many cases, fish figurals in an image with a body of water in it would be fish that are native to those exact waters, as is the case with our Ship, Denmark Zen Puzzle shown above. We also often create and hide a story with our figural pieces within the puzzle: in our Sunrise in a Winter Forest Zen Puzzle, an owl is perched in the winter trees and a hare and mice–animals the owl would hunt–are positioned running quickly across the snow beneath; at the same time, there is an elaborate, romantic figural piece of a horse pulling a sleigh with a man and a woman in it through the snowy woods. Other figural pieces you might find in our puzzles could be a bride and groom ballroom-dancing or different types of dogs, leaves, birds, farm animals, wild animals, flowers, gardening tools, boats, or other eclectic surprises. Figural pieces, known as whimsical pieces (or “Whimsies”) in England, are one of the major features that differentiate the premium, wooden jigsaw puzzle from the die-cut, cardboard puzzle. They were included in wooden puzzles cut in the early 1900’s and throughout the 20th century, but we take them to another level–a level no one but the insatiably curious would ever perceive unless we blog about it. For instance, the Clown Fish is immune to the poison of the anemone in which it lives; in determining the figural pieces for our Chocolate Clownfish Zen and Peapod Puzzles, we based our research for the figural pieces on that fact, and, after some rather specific and lengthy research, we decided the figural pieces for the puzzle would all be fish that were also immune to the poison of the anemone. It is likely that no one in the entire world would ever figure that out on their own from doing the puzzle, but part of our intention is to introduce different types of hidden puzzles into our jigsaw puzzles in case, one day, a puzzle messiah emerges and can’t be satiated without grappling with cryptic, hidden elements in wooden jigsaw puzzles.